This is the big one folks, possibly* the largest S-100 system ever constructed (*for a challenge to this claim see Bill Mills' comments below), the S-100 Multiprocessor, built by Roy Murphy and colleagues at Arjay Data Processing in Scotts Valley, California, as a specialized math machine in about 1985. The following are early pictures prior to the Multiprocessor's move to the DigiBarn as well as the big move. We intend to use the Multiprocessor chassis to exhibit our growing collection of S-100 boards. The S-100 Multiprocessor has some of the original Godbout Electronics (Compupro) boards in it, so we proceeded with a sort of restoration including adding back hundreds of boards (mostly Compupro), an original Wyse-50 monitor and Xerox 8 inch floppy drive units. 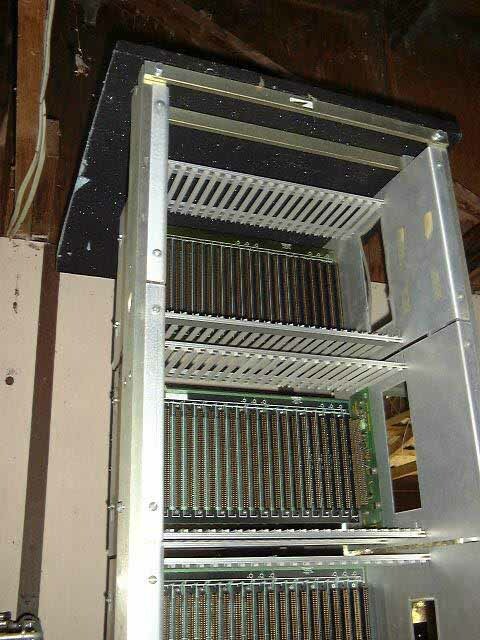 The S-100 multiprocessor contained 8, S-100 Motorola 68000, subprocessor boards, each subprocessor unit was supported by two S-100 memory cards, an S-100 parallel/serial IO card and a bus terminator card, two subprocessor units per card cage. A single additional 68000 processor, with two IO cards and a CRT monitor was used as the control processor. All of these cards were powered by a single100amp switching power supply and mounted in a six foot relay rack, holding five card cages and a CRT monitor/keyboard. The purpose of the S-100 based multiprocessor was to develop the software needed to implement a special purpose finite-element-analysis system to compute the stresses developed complex physical parts for aircraft engines. A new innovative assignment algorithm was developed to solve this complex problem by breaking it down into a very large number of simpler problems with solvable mathematical complexity, Then by efficiently assigning the computation these simple problems, in repeated waves, to the eight subprocessors, the total problem was solved. The assignment algorithm was designed to keep all eight subprocessors active running in parallel, most of the time. Following each wave through the structural elements, an annealing cycle resolved the interface stresses between the structural elements and prepared for the next recomputation wave. A utilization rate of the subprocessors of about 85% of the total time was achieved. Finally, when the process settled, the control S-100 processor intervened and displayed a map of the distribution of stress, through out the physical part, on a CRT. Following successful demonstration of the concept on the S-100 multiprocessor, the technology had advanced by 1990, to enable the migration the concept to the PC format. The entire S-100 hardware design, which had been limited by slow IO data transfer, was replaced by a single special PC board that contained a single Motorola 68030 control processor chip and eight Motorola 68882 functional subprocessor chips. The design was altered to assure that the IO traffic was restricted to the board itself, thus isolating the algorithms intense IO data rates from the slow PC card bus. An innovative method of achieving this very high data rates between subprocessors was invented, using video RAM chips, as a special data storage and high speed data transfer means between the subprocessors . The main PC processor was then only required to prepare the resulting complete solution for a multicolor graphic monitor display. A patent application was prepared for this hardware/software innovation combination. The details on the S100 multiprocessor are long gone. All I remember is that the boards communicated with each other through the parallel interface cards. The master processor handled all communications at the program ran. Basically, it assigned a set of parameters to each sub-processor (finite element of a physical part) and the computational result (the new boundary conditions) was returned to the master from each sub-processor. The master relayed the total new results back to the subs which started on the next cycle. When the boundary conditions stabilized the output stress or temperatures were reported to the printer by the master. All the subs used identical code (a stress tensor) but were assigned unique physical element contours. The code in each sub was based on essentially a 2d or 3d finite differential Poisson function. The code in the master was an assignment algorithm which optimized the use of the subs based on the completion of each sub by overlapping the sub's computations. The PC version, which followed in the design, used the same procedure only here the PC was the master and the subs were a large number of Motorola math processors which communicated with the master with high speed direct memory transfer procedures. The hardware and software of this version was covered by a patent. **By "restored" we mean that some of the original cards (including compupro bus extenders and 68000 boards) were put back into the bays. The rest of the slots were filled by some of the remaining cards that did not end up in the Watsonville dump plus a large number of other S-100 boards from various sources. Bill Mills provided us with this fascinating recounting of perhaps one of the first ever "clusters" or "grids" of personal computers (in this case, S100 units) created by a Mr. Brown of Edmond, Oklahoma, amazing! I beg to differ on Roy Murphy's statement he had the largest S100 multiprocessor system. Back in the middle of the 1980's I was an avid S100 user and searched the Dallas flea markets for S100 parts for my SCP Gazelle. 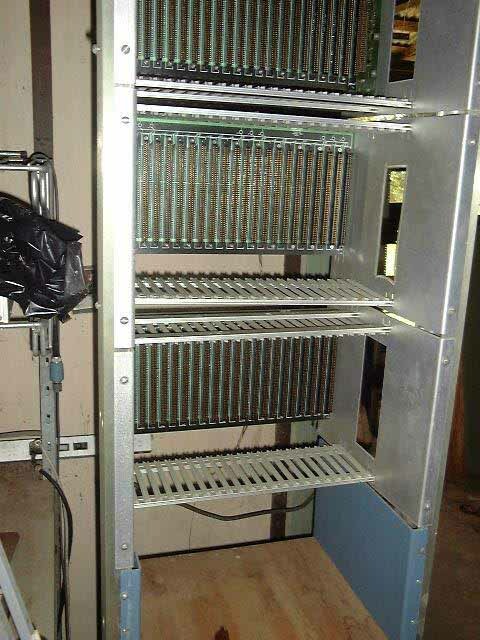 There was a company IMC that built S100 box's with 16 S100 CPU Cards for small businesses. The box's came with an operating system called "Turbo-Dos". It’s been a real long time so I might be wrong on the operating systems name. Anyway, these systems could handle 16 serial terminals, share a single set of hard/floppy drives and came with a coax network interface card. One Saturday morning (about 5am, First Saturday sellers scrounging time using flash lights), under the I75 bridge, I ran across Mr. Brown at the Dallas first Saturday computer flea market back in 1987. He was using these systems to calculate seismic data for oil company surveys. So I started hunting the systems down, rebuilding, testing and delivering them to him at his home. On one occasion I delivered 6 full working systems (96 CPU's) to his back yard Lab in Edmond Oklahoma. In Mr. Brown’s beautiful home office/lab, he had over 100 (1,600 processors) of these systems, rack mounted, 3 walls full (7'high walls), computing 24 hours a day, 7 days a week. Mr. Brown used to have this basket where the oil companies would send him pay and royalty checks for processing the seismic data. The basket was always full (I did see one of the checks one time for $20,000). This guy was making a ton of money while he slept. 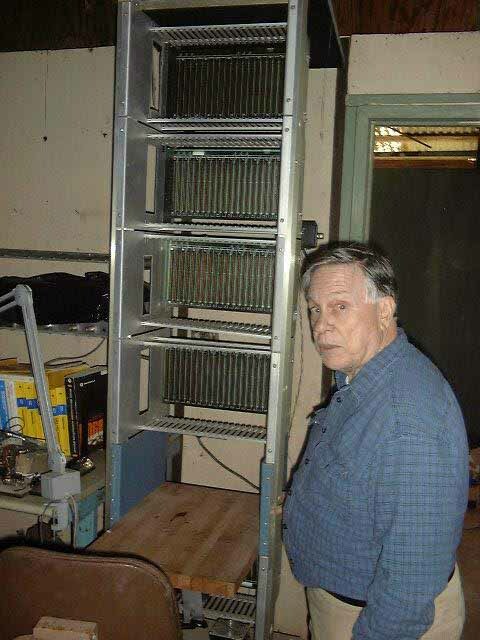 Mr. Brown was the king of S100 parallel computing. He wrote all the software and designed the system to receive and deliver the huge amount of data that was processed (on reel to reel tapes). He designed the network backbone that transferred the data between all the S100 boxes. He had patents on the process and on the mathematics. Visiting his lab was like visiting computer heaven. It was a glorious site to see, like standing inside a supercomputer. I was hauling in so many of the systems I even had a personal 16 CPU system for a while. But, alas Mr. Brown paid very well for every system he could get his hands on and I eventually gave in and sold it to him. Mr. Brown and I continued the S100 relationship into about 1993. Also, I notice you don’t have any MultiDos systems in your museum. You should try to see if you can find one. No S100 museum is complete with out one of these systems. You know, those were the best and most fun days in computing. My oldest son used to stand at our flea market table at 6am and tell everybody what was what. He was 10 then. Rain or shin, we showed up every Saturday for 15 years. I sold my Commodore SX Portable there and we bought our first copy of Wolfenstien there. Know anything more about large, custom-built S-100 systems? Contact us!